In 1998, I was a senior in college, already concerned with grownup things like dental insurance and law school applications. I still loved music, still went to shows and still worked at the radio station, but that single-minded obsession of my teenage years was over. Or so I thought. The album opens simply, clean acoustic guitar and some slightly overdubbed vocals, just professional sounding enough to draw you in and leave you unprepared for what will happen next. By the time you are midway through, as Jeff Mangum’s nasal and strained voice over a distorted, poorly recorded acoustic guitar transitions into what sounds like a full horn section playing old Balkan shanties, there’s no escape. I bought it that day (remember buying music?) and for all I know it’s the only thing I listened to at all for the next three months. They weren’t my “favorite band.” They were a part of me. In 1998, this band that was a part of me went on tour, but I was busy that night and decided it wasn’t worth the trip into the city to catch the show. They’d be back, right? Shortly thereafter, Jeff Mangum rather famously disappeared. He wouldn’t do interviews and he wouldn’t record, and suddenly this album became not just an album but an artifact. It became a code word for a certain type of music lover, a secret handshake for the pre-hipster indie crowd. By 2005, Pitchfork felt comfortable giving it a perfect 10 while reflecting that it was “not cool” in the same way as OK Computer or Loveless were. And it isn’t. It’s earnest, and heartfelt, beyond belief. It’s music so raw and so personal that the man who wrote and recorded it had to take more than ten years off from the world just to recover. 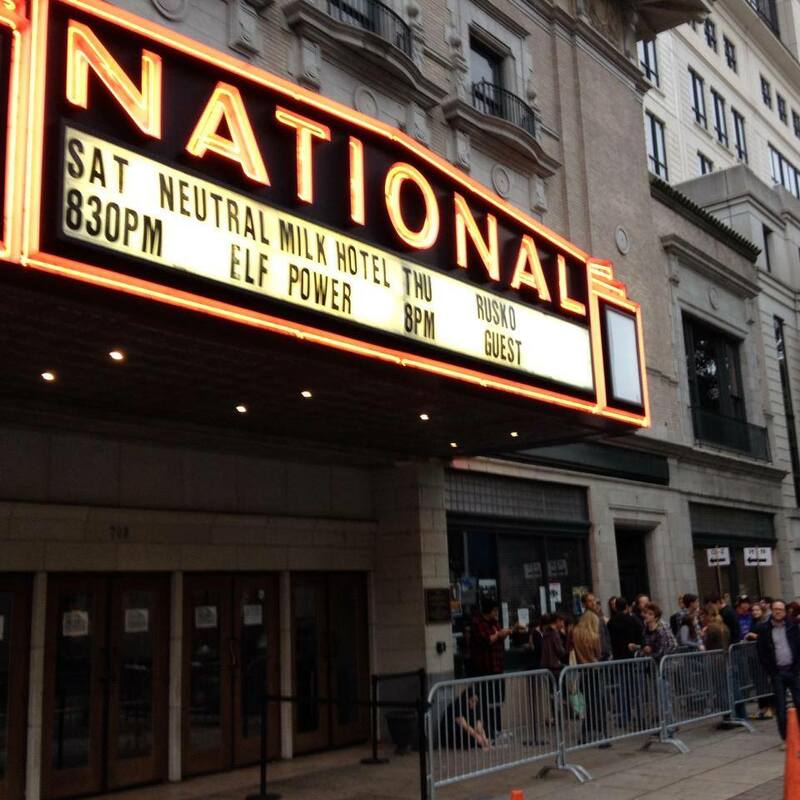 All of this is to say: a Neutral Milk Hotel reunion tour is kind of a big deal. Fifteen years after the band dropped this nuclear bomb on late-90’s college radio and then quietly disappeared, they were going to come out and play it for us. I thought of this as sort of a nostalgia tour on my drive down to The National theater in Richmond, VA, on the afternoon before the show. Jeff Mangum strolled out on stage to the kind of deafening roar that a crowd five times that size might make. Completely hidden behind a bushy beard and long hair under a ballcap pulled almost completely down under his eyes, he hesitated only briefly before looking up and saying “Hello, friends.” And then he smiled. The roars that time were ten times as loud. The smile was all the explanation we needed for the last fifteen years. I haven’t read any interviews with him recently, and I don’t know if he’s giving any. He left us, and then he returned, and that’s all I need to know. The show opened with that familiar, awful-but-compelling voice singing the first few lines of “Two-Headed Boy.” A few minutes in and we were all totally under his spell. And then the rest of the band strolled out, and we realized suddenly what was coming. That segue on the album into “The Fool,” when the horns come in and the drum starts a lazy waltz, that segue where your heart swells and you understand what this music can really do? That happened. We all felt it coming and we cheered and clapped so loud in sheer anticipation, sheer delight, that we could barely hear the band when they actually came in. There just isn’t anyway to articulate how thrilled, how grateful the room felt when we knew they were back and as good as they’d ever been. And they know it too. Julian Koster grinned an impish grin and said “We’re back!” to those of us close enough to hear it. The band sounds much looser, much more confident, and even more rockin’ on this tour. The bass guitar is way up in the mix, playing a fast driving rock arpeggio that’s muted or even missing on the album versions of the louder songs. The setlist sprinkled in a few lesser-known B-sides and quite a few numbers from “On Avery Island,” using some of those slower numbers to spread out the energy of the more raucous, well-known singalongs. Jeff Mangum stands off to one side as the horn players take center stage, and the band members all sing along loudly (though off-mic) to every lyric. Scott Spillane still wears his famous beard-without-a-mustache (what is that called? ), but now it is Santa Claus white, and he laughs and smiles throughout the entire set. Even the drummer’s comical handlebar mustache doesn’t look like an ironic Williamsburg mustache. It just looks weird, and therefore wonderful. Which is how this eclectic mix of guitar, saw, theremin and french horn often sound. The combination makes no sense and so the only way to make sense of it is for them to develop a sound all their own. A sound that used to signify the terror of living in an attic under a Nazi regime, and has now been cranked up to signify the terror and joy of a new-found liberation. Let’s hope that freedom suits them.